Viruses are the most dangerous contaminants of human blood and blood products. The purpose of this study was to investigate the light-mediated virus-inactivating properties of fullerene and its effect on the intactness of biological fluids. Influenza virus was propagated in chicken embryos, and a water suspension of C60 fullerene was added to the allantoic fluid. The fluid was light-irradiated with a constant flow of oxygen through the specimen, and the dynamics of the virus titer were studied in Madin-Darby canine kidney (MDCK) cells. The morphology of the virions was studied by electron microscopy (EM). The electrophoretic pattern of the proteins in the allantoic fluid and blood plasma, as well as the growth properties of the calf serum were compared before and after 6h of irradiation. A dramatic drop of infectious titer (from 6 to 0 log10 EID50) in the virus was observed within 2h after the start of irradiation. No change in the titers was observed in control specimens without the fullerene, or light, or oxygen. EM revealed numerous defects in the morphology of the virions (destruction of the outer membrane) leading to the loss of infectious properties in the virus. Based on comparison of proteins and growth properties of the serum, no differences were revealed between intact and irradiated biological fluids. 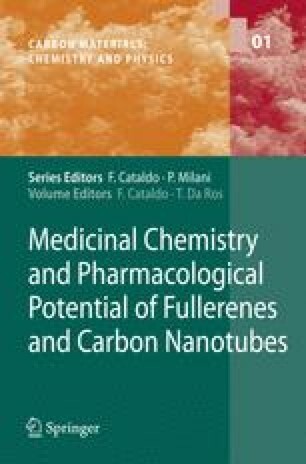 Water-insoluble fullerenes may therefore be considered an effective and safe way to inactivate enveloped viruses in biological materials including blood products.